Pain of any kind is a sign somethings wrong. Some people silence the pain with drugs. But that would be like removing the battery to quiet a smoke detector! The nerve-rich facet joints on the back side of each spinal bone are a common cause of back pain. The pain can be a sign that these interlocking fingers arent moving properly. Specific chiropractic adjustments can help the spine right itself. By restoring the way your spine works, nerve involvement is reduced, pain eases and the body can heal. If you dont have a chiropractor, find a qualified Association member chiropractor near you today! First, chiropractors dont dispense drugs. 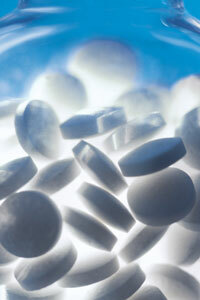 Muscle [relaxers] and even the most common over-the-counter pain medications fail on two counts. First, while convenient, they dont address the underlying cause of your problem. Second, side effects such as addiction, kidney failure, liver damage and even death can result. When properly applied, ice can have an analgesic effect without the side effects associated with pain medications. Chiropractic works because you are a self-healing, self-regulating organism controlled by your nervous system. Millions of instructions flow from your brain, down the spinal cord, and out to every organ and tissue. Signals sent back to the brain confirm if the body is working correctly. Improper motion or position of the moving bones of the spine can interfere with this vital exchange by irritating nerves and compromising the function of affected organs and tissues. Specific spinal adjustments help improve mind/body communications. Health often returns with improved nervous system control of the body. These days, many policies cover at least some of the care youll need. Its convenient when an insurance company or some other third party helps pay the bill. But be careful! Dont allow the profit motives of a huge corporation to make decisions for you. If you sincerely want your health back, a chiropractor can help. Find out how chiropractors make state-of-the-art chiropractic care affordable for just about anyone.